Bann Rowing Club re-write the History Books. Bann Rowing Club J18 eight have broken numerous records with their fabulous “top ten” finish in the 2010 Schools Head of the River Race, over the Oxford and Cambridge university Championship course on the River Thames. Bann are now the only Irish Crew, in the entire history of this event, to ever finish in the top ten of overall crews, gaining eighth place in the J18 Championship category and ninth place overall. This was exactly the finishing position targeted by Bann coach Seamus Reynolds and the Bann crew delivered in considerable style. The top ranked Irish crew, Portora Royal, finished equal thirty first in a time of 19:03 compared to Bann’s ninth place in a time of time 18:18 over the full 6,800m ( four and a quarter mile) Championship course from Chiswick Bridge to Putney. Bann had completed their water training with an intensive two day camp with Queens University’s Intermediate and Senior mens squads. Precise timing splits, like Formula One lap times for racing cars, were set which the Bann crew needed to achieve for strategic locations during the big London race. This, very hard, “Belfast” camp ended confidently, based on the split-race times achieved, and the Bann team arrived in London at their host Club, Tideway Scullers School on Tuesday morning. After Seamus had rigged their borrowed boat, the “Alec Hodges” and set the oars, the Bann crew were soon on the mighty River Thames tideway for the first time in their lives. From the very first stroke, the boat, which had been selected for our use by Bann Olympian Alan Campbell, simply flew off, perfectly balanced and ideal in weight for our crew. Because we had never entered this race before, Bann had to start right at the back of the Championship field in 41st place, out of a massive total race entry of 256 boats. This dictated tactics as we would have to overtake slower boats if we were to achieve a top ten finish. It would also mean having to row through dirty, churned, water from the boats starting before us, not having the benefit of the maximum flow compared to boats starting earlier and Bann would have to leave the racing line in order to overtake. 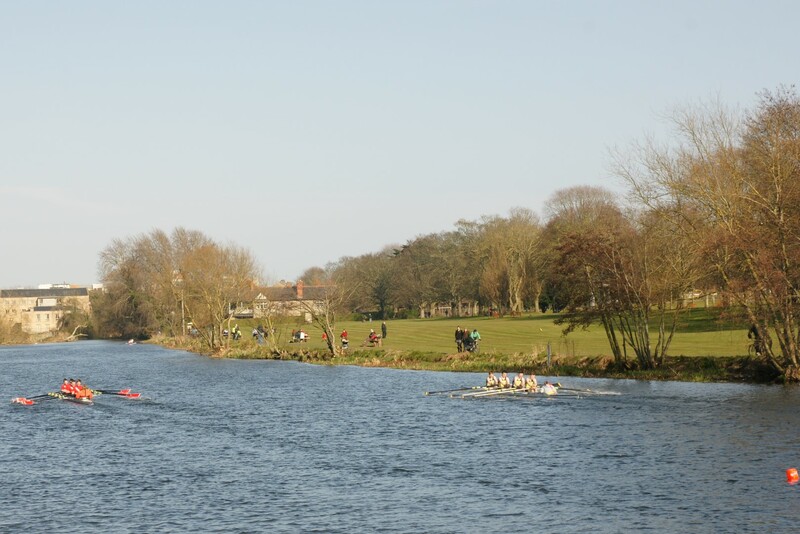 But the disadvantages of such a small rowing Club as Bann competing against the might of elite British schools, like Eton, Radley, St. Pauls, Westminster and Abingdon, and elite International schools including Italian champions Canottieri Milano, actually worked to strengthen Bann’s determination to shock everyone right here on the Thames. It was going to be like the Irish Rugby team winning at Twickenham all over again. The race started and immediately Eton 2nd crew, universally tipped to come second overall, tried to burst past Bann before Barnes Bridge, but the Bann men weren’t having it, held their nerve and their racing line, and within the first 300m Bann had already caught and overtaken the Italian champions Canottieri Milano in boat 40. Fast and furious racing ensued with Bann’s fifteen year old prodigy strokeman Joel Cassells sticking exactly to his race instructions and the whole Bann crew backing up 100% his powerful rhythm, bladework, stroke rate and length. At the iconic Hammersmith Bridge landmark, Bann’s cox, Ryan “Acer” Hurrican, showed just why he is rated the best in Ireland. Eton were still breathing down our necks, a slow moving boat in front was refusing to give way, and the narrow racing line under the bridge and then around the buoys at the corner lay ahead. Instinctive, brilliant decisions were taken instantly and from Hammersmith to the finish at Putney Bridge the real hard, hard race for the finish line started. Only top class crews can raise their game over this exhausting, closing stage and the Bann men did just that. Every single man in this great Bann crew kept their technique, power and length of stroke and they pushed the stroke rate up, increasing boatspeed with every single stroke, for every single second in time during all of those seven, remaining,” lung-bursting” minutes to the finish. 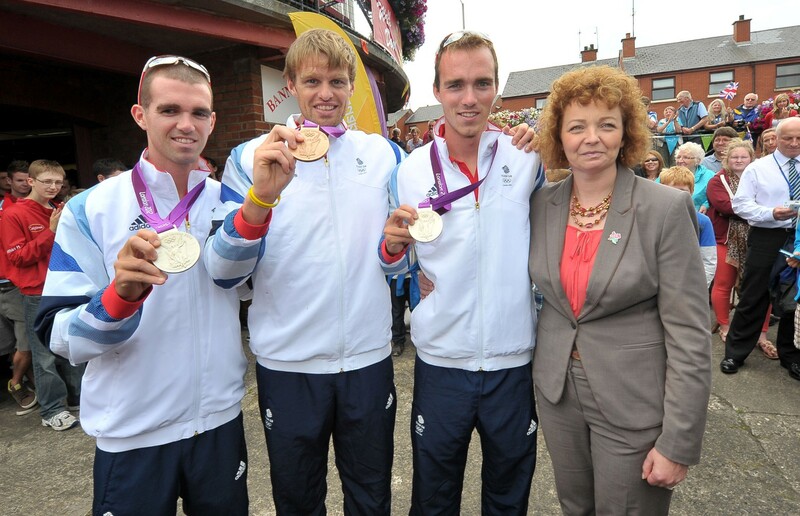 The race plan worked perfectly & was executed to perfection by the Bann crew. 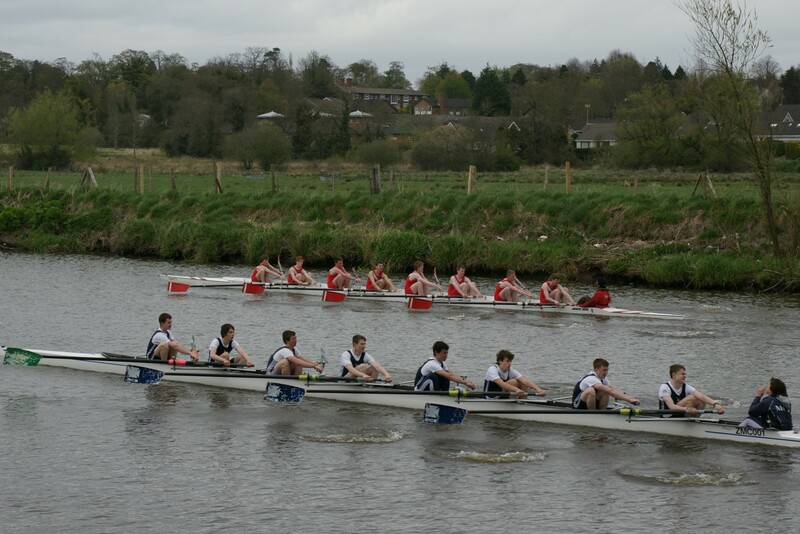 No less than five championship crews were overtaken by the Bann men. 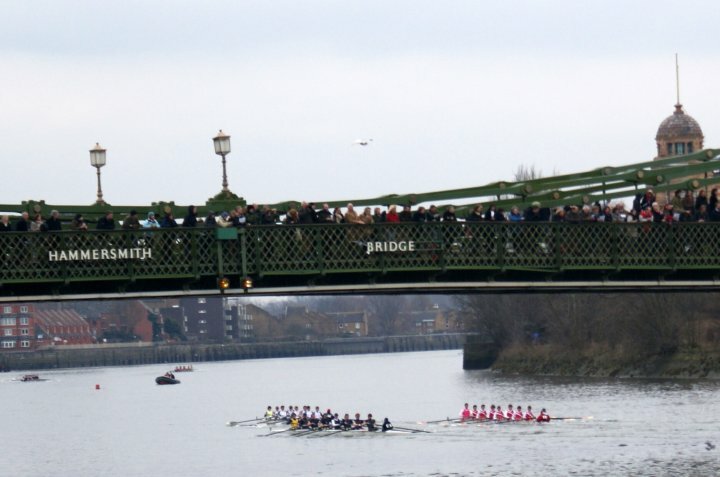 At Putney the finish flashed by and the historic “top ten” performance from Bann’s 2010 J18 crew had re-written all previous Irish efforts in the record books of Schools Head of the River Race. Eighty seven year old, Bann Club President Bobbie Platt MBE, said that he had lived a very long time waiting to see this great day for Bann Rowing Club. He continued to praise the crew and their coach Seamus Reynolds, whom he himself had coached, and added that Bann had achieved all this with the youngest crew rowing here at J18 Champion Class in this, the highest possible level of Schools Rowing. The other crews here were significantly older and, unlike our Bann crew, were full of Internationals. Bann Captain Keith Leighton added his congratulations to Seamus and thanked the cox and every rower individually, adding,” this was undoubtedly Bann’s greatest day… to date.” Keith proceeded to thank our excellent host Alan Campbell, for personally organizing everything at ”the London end of things” and took the opportunity to congratulate Alan on his recent engagement to Miss Jules Parkinson.